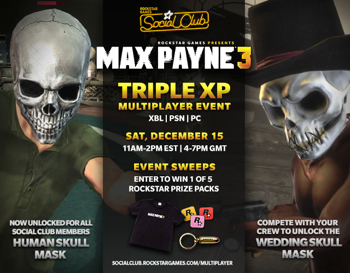 Rockstar revives Max Payne 3's multiplayer community with some weekend bonuses. If you've been itching for a reason to revisit Rockstar's Max Payne 3, this weekend might just be what you've been waiting for. To help breath some life into the title's multiplayer scene, Rockstar is hosting a triple XP weekend and a special event complete with a free unlockable mask for Social Club members. If you happen to be a member of the club, you'll gain access to a free skull mask to customize your killer. If you participate in the event with your friends, you'll have the chance to score a different skull mask - complete with a top hat - if your crew lands in the top 10 on either Xbox 360, PlayStation 3, or PC. But don't worry, if you just feel like jumping in and playing a few games, you'll still have the opportunity to score some additional goodies: A sweepstakes will be held for all those who participate and a handful of randomly selected winners will get a Max Payne 3 t-shirt, a bullet keychain, and some Rockstar stickers. Rockstar's own employees will also be participating in the event, and will be easily identified by their "MaxPayneDev" user names on each platform. The mayhem begins Saturday, December 15 at 11AM EST, and will run until approximately 2PM EST, though the triple XP bonus will be live all weekend.